← KING SOLOMON, (Eagle’s Nest, Fairy Prince, Fairy Queen, Hector, King Solomon, Magpie, Miranda, Rocket, Wasp), aka NORTH RAND SILVER MINING CO., SAN FRANCISCO GOLD, and SHIPSEY MINING & MILLING CO.
November 17, 1897; ‘ The new ten-stamp mill at Johannesburg is nearly ready for operating. The machinery is all in nearly all in place and the building is nearing completion. A batch or ore from the Gold Bar mine, just East of the Alameda, and now under bond by Postmaster Curtiss and others of Johannesburg will be the first run through. 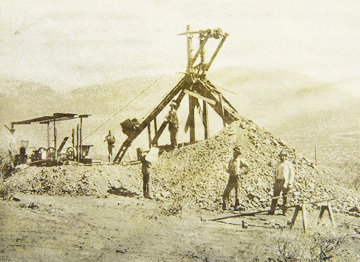 March 1898: “To the north of the town of Randsburg one mile, butting up against the town site and near the Main street of the town of Johannesburg, is the Gold Bar Mine, owned by Messrs. John Perdue and L. F. Thurston. 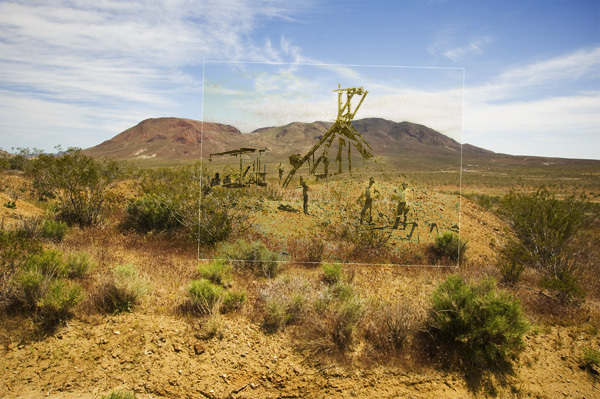 The gold bar joins the famous Alameda mine on the east, and has the same system of veins as the big Val Verde and Ruby group, the letter of which is just now turning out such large quantities of paying ore.
Messrs. Perdue and Thurston are the original locator’s of the Gold Bar, having monumented her claim April 10, 1897. Shafts to the depth of 40 and 130 feet respectively have been sunk on a vein of very large size, which drifts have been run off, blocking our a large amount of ore.
A cut of the mine is herewith presented, showing the new gasoline hoist in operation on the deepest shaft. Much of the ore is high grade, but the owners base their hopes on the immense bodies of low-grade ore which they are developing. Besides the Gold Bar, Mr. Perdue is the owner of other good properties, notably the Alpha, northeast of the town, which is producing some very rich ore.